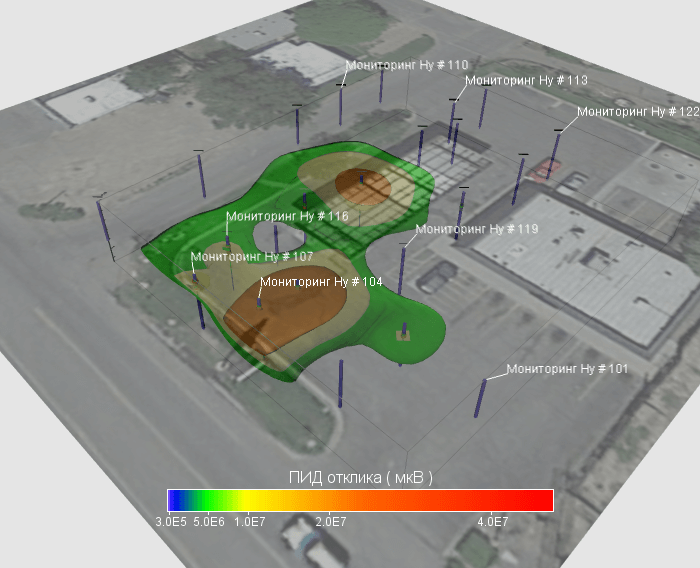 Drape vector data over 3D surfaces to create valuable overlays of GIS data and other vector maps that include point, line, or polygon data. Simply import any one of the supported vector file formats (BLN, BNA, DXF, E00, GSB, GSI, KML, KMZ, MIF, or SHP) and drag the connector to a 3D surface module to overlay it on the 3D surface. Voxler offers vector overlay customizations, allowing full control of colors, line width, and opacity. All vector overlays are treated as true vectors, so zero pixilation occurs and the points, lines, and polygon borders look crisp and clean at any zoom level. 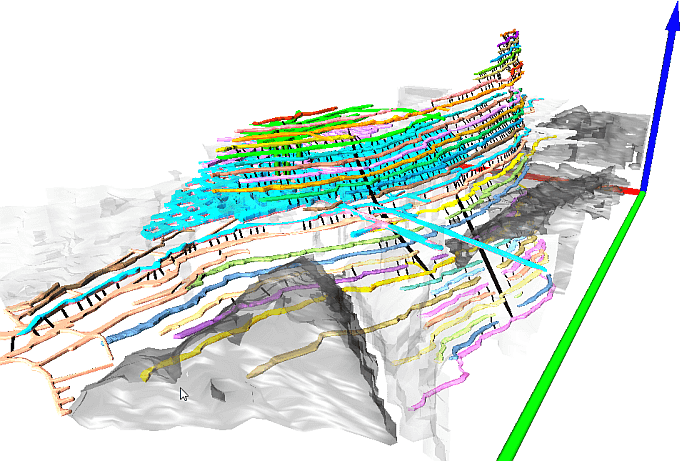 An example 3D DXF of an abandoned mine where the different tunnels and shafts have been rendering using different colors. 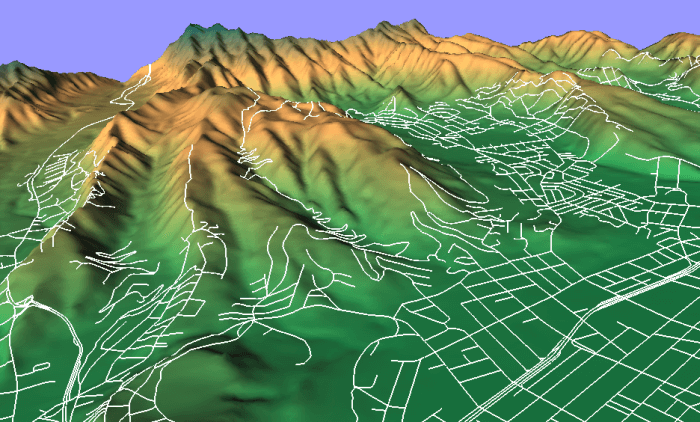 LAS files containing post-processed LiDAR data can now be imported into Voxler 4. 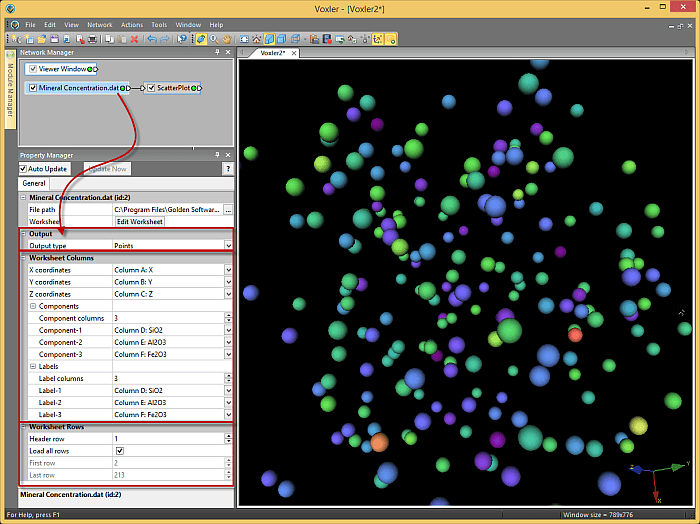 Multiple filters are available at the time of import that aid in extracting the desired data from LAS files. 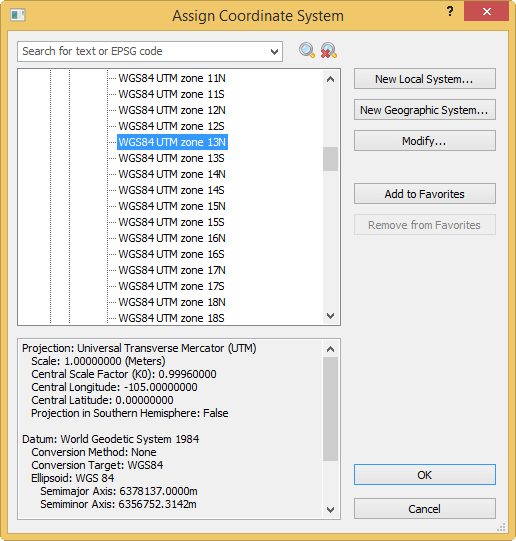 LAS using any of the ASPRS LiDAR classification codes (unclassified, Ground, Low Vegetation, High Vegetation, etc) can be used to filter points based on the classification codes at the time of import. 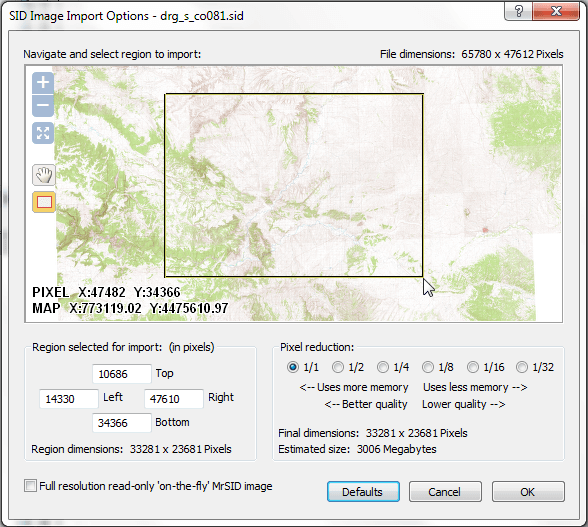 Spatial filtering is available at the time of import, which can be used to reduce the extent of large LiDAR datasets. Sample filtering is also available at the time of import that can down sample LAS files if necessary. 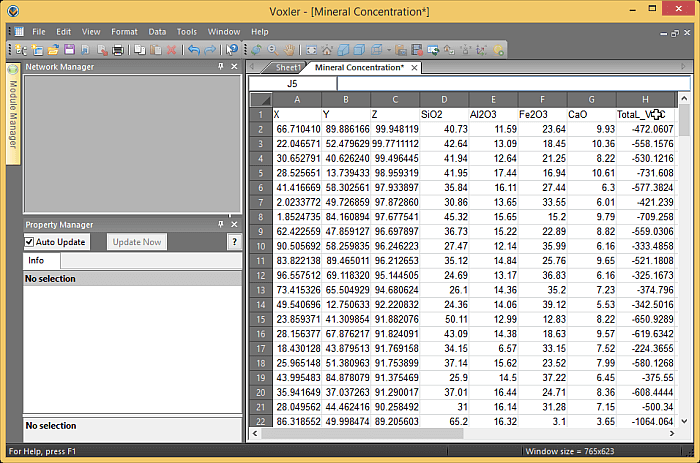 All of these filtering options can be used in conjunction with one another, making Voxler 4 a powerful LiDAR tool. 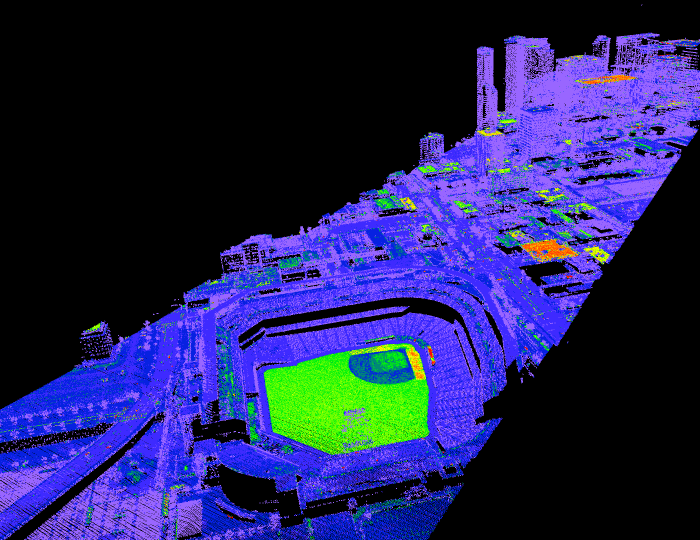 A LiDAR scan of downtown Denver, including Coors Field, that is being rendered in Voxler as a ScatterPlot. 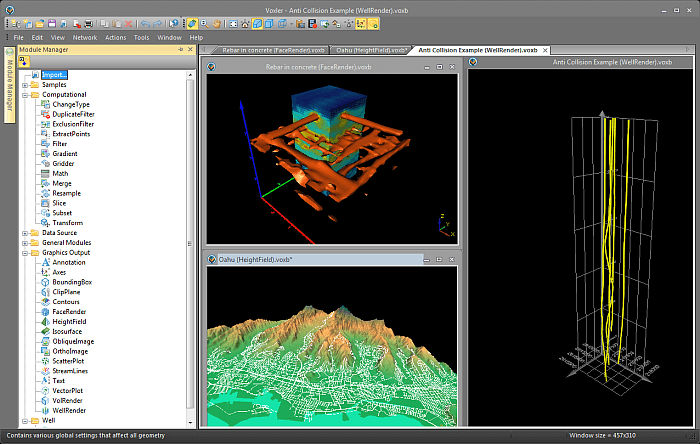 Voxler is an excellent tool for filtering and visualizing LAS LiDAR data. 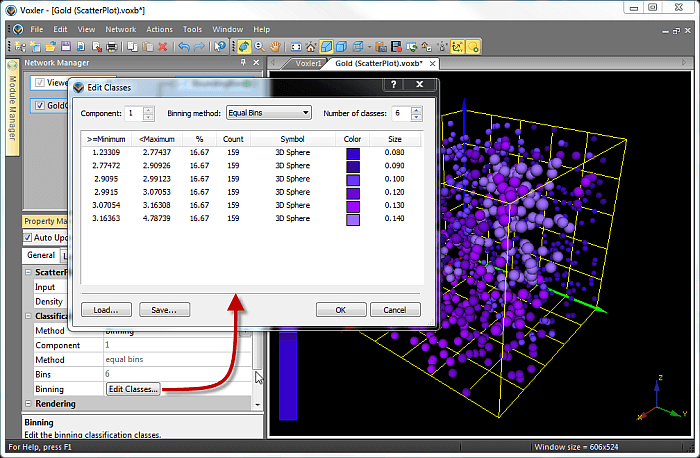 Binning ScatterPlot points in the new Edit Classes dialog into 6 equal classes. 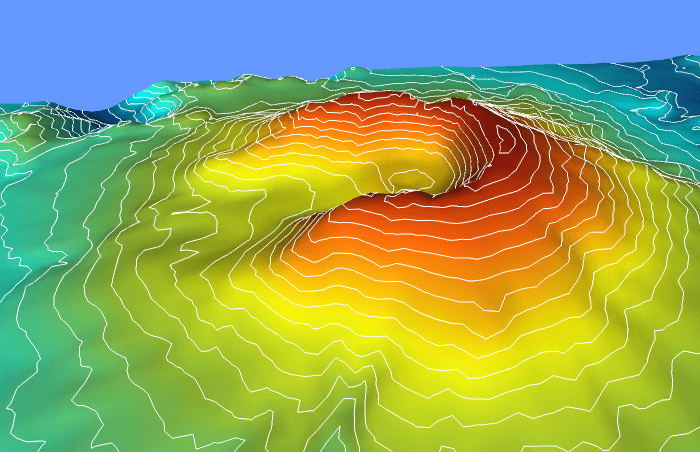 Contours generated from Contours modules can now be used as the input for the new vector overlay feature. 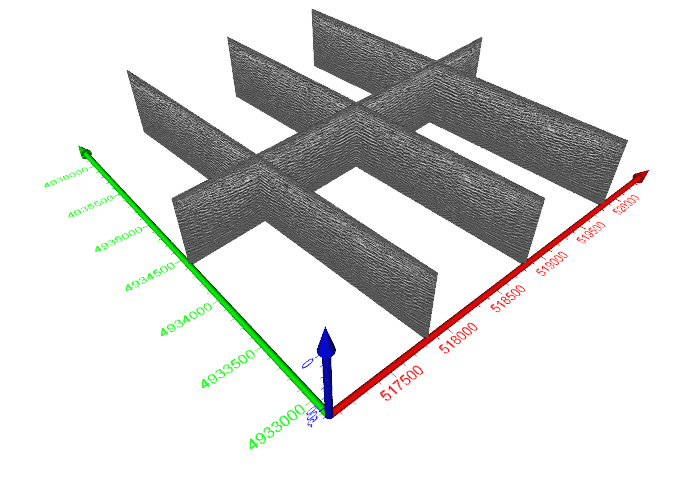 This addition allows contours generated from another lattice source or grid to be overlaid on a 3D surface. 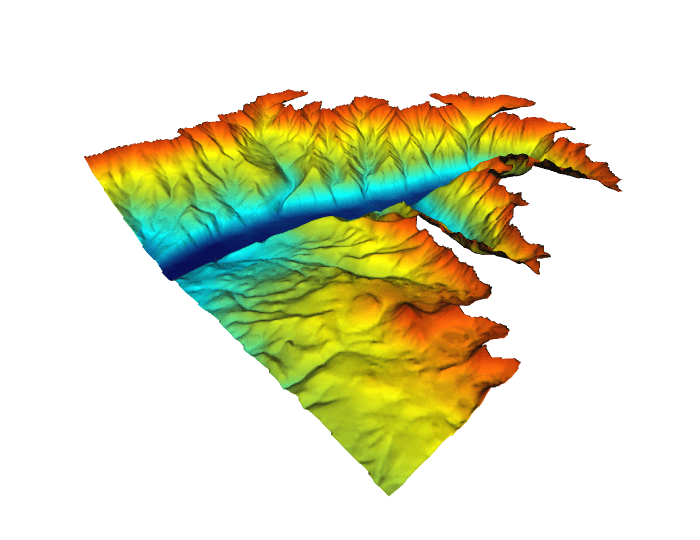 Multiple variables can now be displayed at the same time; for example geophysical property contours can be overlaid on a topography 3D surface to generate a more informative model. Contours can now be used as a Vector Overlay on a 3D surface; where they drape without pixilation. 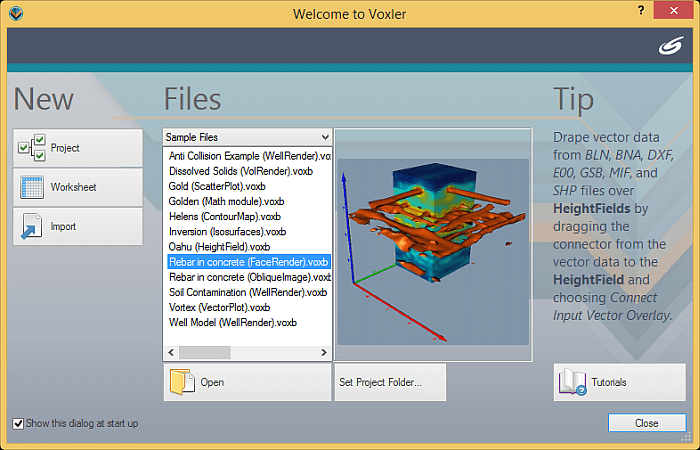 For more new features of Voxler 4, see the attached PDF: NewFeaturesOfVoxler4.pdf. If you're interested in new features added into older versions, see the attached PDFs: NewFeaturesOfVoxler3.pdf and NewFeaturesOfVoxler2.pdf.